(CNN) -- Relief teams dug through rose gardens at the headquarters of the Bangladesh Rifles Sunday, looking for more than 70 army officers still missing -- and presumed killed -- after a deadly uprising by paramilitary forces last week. 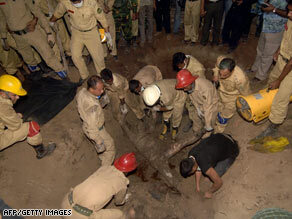 Bangladeshi firefighters continued to uncover bodies Friday of Bangladesh Rifles officers from a mass grave. By late Saturday night, 72 bodies had been found floating in a river or in three mass graves inside the compound of the Rifles, or BDR, in the capital city, Dhaka, the Home Ministry said. Fifty of the dead were confirmed to be army officers, shot or stabbed to death. Another six were Rifles troops, or jawans. The rest of the bodies were too damaged for immediate identification, the ministry said. But four days since the rebellion, grieving family members keeping vigil outside the headquarters were losing hope of seeing their loved ones alive again. Some men quietly recited verses from the Quran, Islam's holy book, or counted prayer beads. Several women howled in despair and collapsed hopelessly on the pavement. Sympathy for the mutineers has dried up, a Bangladeshi journalist said. "The first day of the incident, Bangladeshis were for the BDR. They thought they had legitimate concerns of army officer corruption and denial of basic necessities to them," said Ashraf Kaiser, host of the television show, "Road to Democracy." "But from the second day, when we started getting news of missing officers and seeing pictures of one body after another being pulled out, the perception changed," he said. One can see the shift in the media coverage of the mutiny, he said. "What was being called Pilkhana revolt or rebellion" -- named after the area of the city where the BDR compounds are located -- "is now being dubbed the Pilkhana massacre." Prime Minister Sheikh Hasina initially earned high marks for persuading the jawans to surrender in exchange for amnesty. But now she finds herself in a delicate balancing act: trying to appease an army that demands the killers, who stubbed out the lives of so many of its officers, be punished. She met for hours Sunday with the army's top officials, and made several concessions. A committee the Home Ministry set up to investigate the mutiny will be shuffled to include more members from the army's ranks. She has also backtracked from her promise of amnesty. Killers will face trial, she said, and ordered jawans to return to their posts or report to police stations by the end of the day Sunday. Hundreds of jawans lined up at a field outside the Pilkhana headquarters, insisting to reporters they fled the compound during the rebellion. They kissed their loved ones as they waited, assuring wives and fathers they were innocent but asking for their prayers. The fear of a military take-over is a pervasive one in Bangladesh. The country has experienced a series of coup since its independence in 1971, including one that killed Hasina's father -- the country's independence leader. The current government itself came to power in December, after two years of an army-backed rule. "Hasina has her responsibility to keep peace and tranquility and so she did what she did," said Aneeqa Khan, a student who lives not far from the BDR headquarters. "And you can't fault the army from reacting. They lost so many people." The military did its part to allay fears of retaliation. "I believe if exemplary punishment is meted out to the people involved directly or indirectly in the mutiny, it will help pacify the anger among our officers and soldiers," Brig. Gen. Mahmud Hossain told reporters. The standoff started Wednesday when BDR troops rebelled against their commanders. The BDR is a paramilitary force distinct from the army, but its commanders are career army officers. The Rifles is responsible primarily for guarding the country's borders. The force, more than 65,000-strong, also takes part in operations such as monitoring polls. The troops staged their rebellion on the second day of BDR Week, when officers and troops from various BDR outposts along the border were in the capital for celebrations. Discontent had been bubbling for years in the ranks of the BDR, who complained their army superiors dismissed their appeals for more pay, subsidized food and their requests to participate in United Nations peacekeeping operations -- which pay far more than what they make at home. Bangladesh and its South Asian neighbors are the largest troop contributors to U.N. peacekeeping operations. During the stand-off, dozens of officers were killed. Some bodies were dumped in mass graves. Others were tossed in sewers that emptied into the Buriganga River, where they floated for miles before being retrieved.